"Please come and get these pups or they're going to die," the man's voice on the other end of the line said during a late night call for help. He was distressed, desperate and frantic, Tonya Littlewolf told The Dodo of that call back in 2004. 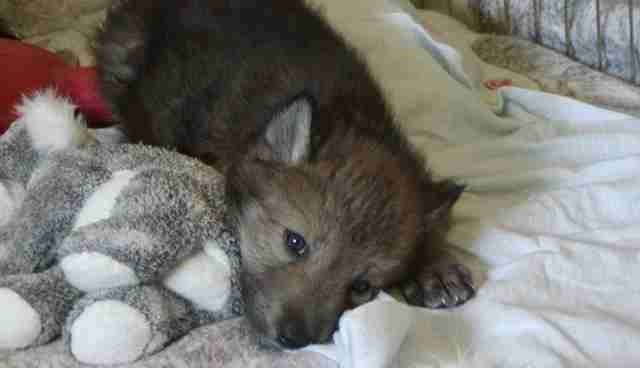 He wanted to help but he needed someone to help him save the wolf pups who were left outside in a cage in the cold. 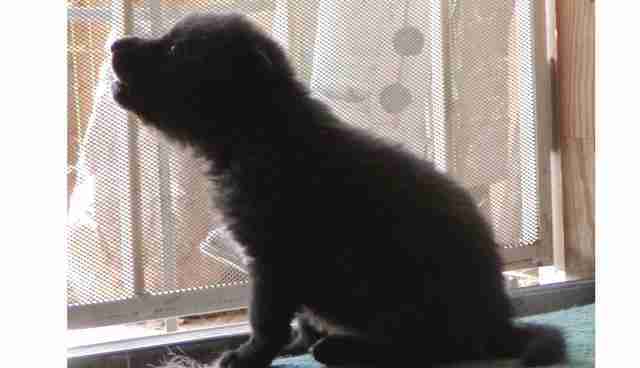 The story got worse: The puppies had been purposefully left out to die. 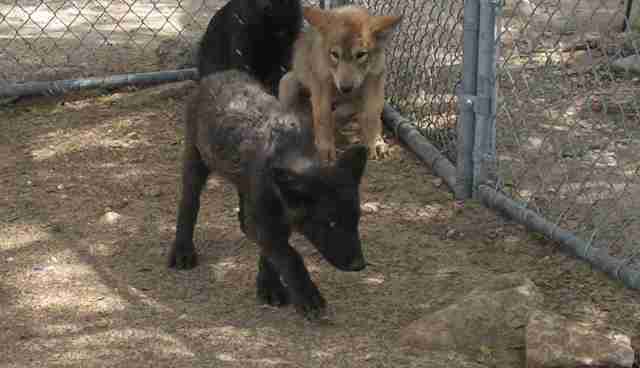 Just 13 days old, the three pups, two of whom were siblings, were born to two wolf mothers owned by a breeder. The man calling was a groundskeeper who worked for the breeder, a woman who deemed the pups worthless runts. She took them away from their mothers and placed them outside in a freezing cage. The man told Tonya that the mother wolves were crying in vain for their pups. When Tonya received the call, the pups had been without food, water or mother's milk for 24 hours. "I don't know how to feed them," the groundskeeper said. "You have to help." The rescue had to be clandestine; the breeder could not know a call had been made to Tonya, founder of Wolf Mountain Sanctuary in Lucerne Valley, Calif.
Tonya started the all-volunteer sanctuary in 1985, "but I've been working with wolves since I was knee high to a grasshopper," she said, adding that her grandfather saved wolves and cougars in New Mexico. 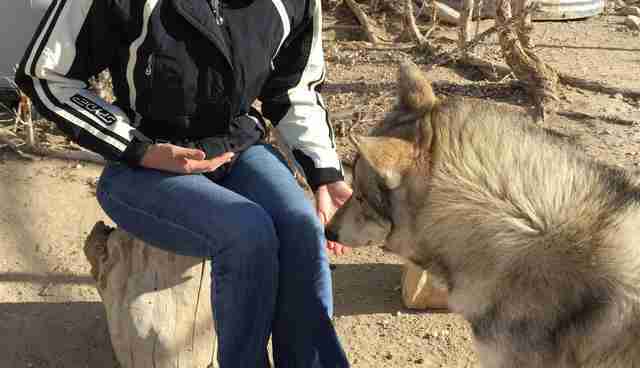 Her heritage is part Apache and part Sicilian, and she has been around wolves her entire life, making it her life's mission to educate people about their plight and to help save them from extinction. 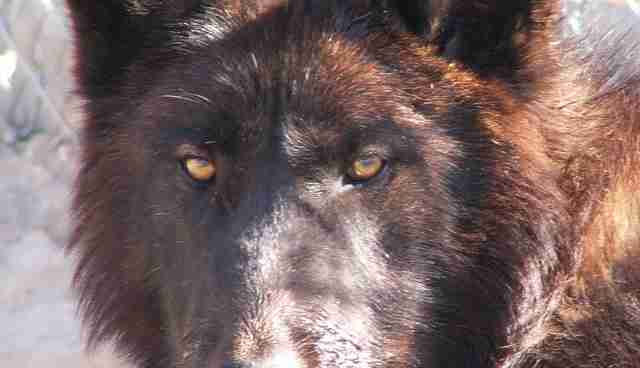 Many of the wolves at the sanctuary have been rescued from the movie industry, private breeders and private owners. To ensure the three pups' safety, Tonya, who knew the breeder and the safest way in which to deal with the situation, made a call the next morning and asked the woman if she had any wolves she didn't want. "Yes, I got three runts that I can't sell. 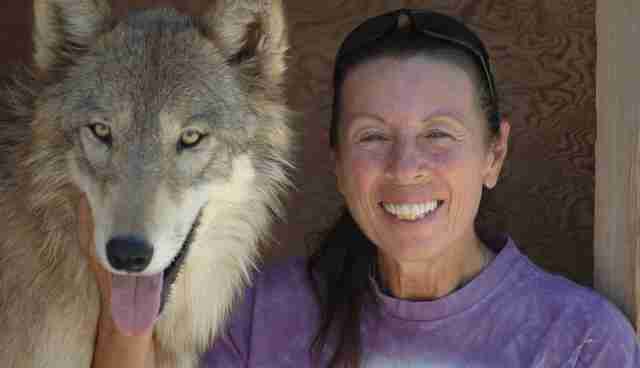 If you want 'em, you need to get 'em now," the breeder told Tonya, who was willing to pick up the wolves. However, the breeder said she would transport them as, according to Tonya, she didn't want anyone to know her location. The pups arrived and they needed names: The first female, a Montana tundra, was named Wacipi (Shadow Dancer); her brother, a Montana tundra, was named Yawto (Sing to Me). A third unrelated female, a Montana gray, was named Wanagi (Guiding Spirit). All three pups were sick upon arrival. They were crying, dirty, dehydrated, stressed and didn't know how to drink from a bottle. "I always have puppy milk and kitten milk on hand just in case," Tonya said. She immediately set up an appointment with her vet, who determined the pups were infested with parasites. They were also underweight at 2.5 lbs., when they should have been at least 3.5 lbs. The pups were set up with IV fluids, antibiotics and round-the-clock care. "The vet said I couldn't stay with them, but I talked it into him and brought in a cot," Tonya said. Although they were each in separate cages, "I put my cot up against the wall, took them out and slept with them. Wacipi laid on my heart, Yawto under my left arm with his head on my chest and Wanagi on my right side. I got up every two hours to feed them and clean their bottoms." When the pups were released, Tonya brought them to her private home at the sanctuary. They came with their medications and the stuffed animals she had bought for them. Wacipi, Yawto and Wanagi slept in bed with her until they got bigger and then slept in crates in her room. The first week of recovery was trying, but they all made it with round-the-clock care from Tonya and the dedicated volunteers. From the start, "Wanagi had tummy problems because they were starved," Tonya said. "They panicked on food and still have food aggression with each other. Wacipi, the omega, always ate last." The alpha wolf is the leader and the omega is the one who is the pleaser of the pack. Now the three orphaned siblings are almost 12 years old. It took the team and lots of hard work to get them out of the woods and healthy, but they now thrive at the sanctuary. "They love people," Tonya said. Wacipi is still the omega when she is with Wanagi and Yawto, and so she now resides in a pen with another wolf, Balto, where she is more alpha. Wanagi and Yawto, both alphas who get along, are together in another pen. While they argue and get jealous of one another, they never hurt each other. They have funny personalities, love all the volunteers and compete for attention. Yawto has a habit of moving around his igloo and likes to stand on it. Visitors frequent Wolf Mountain Sanctuary for tours and to learn about wolves, their history and their importance in the ecosystem. Wolves are actually very shy with people in the wild and try to stay away from them, according to Tonya. With each other they are very social, intelligent, affectionate, loving and family-oriented animals who mate for life. Currently there are 10 wolves at the sanctuary. Totally different from dogs but also not "the big bad wolf" of folk lore, wolves or wolf dogs aren't meant to be family pets, Tonya said. "Wolves belong in the wild," she said. "Once they are in captivity, they cannot go back in the wild. They are too humanized and don't know how to hunt." 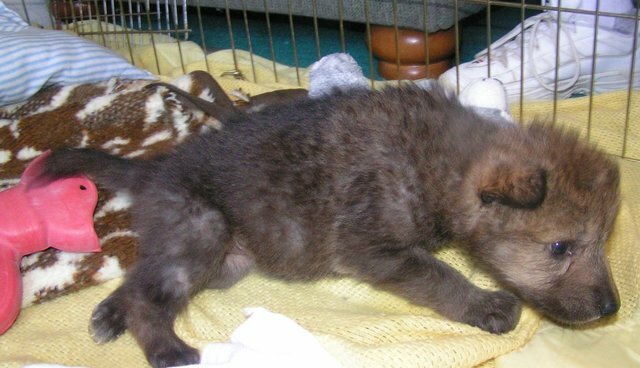 There are numerous rescues that are filled with wolves and wolf dogs who were dumped by people who had no idea of what they were getting into when they bought them from breeders. "People buy them when they are 6 and 7 months old, and then they decide they can't take care of them," Tonya said. Wolves are continually under attack by hunters. Their very existence is threatened while they are stripped of federal protections, even though there is no known record of a healthy wolf attacking a human in the U.S., according to Tonya and the Humane Society of the United States. "Wolves are very special like the rest of all wildlife and they are part of the circle of life. There's a reason why they are here," Tonya said. For more information and to learn more, please visit Wolf Mountain Sanctuary. 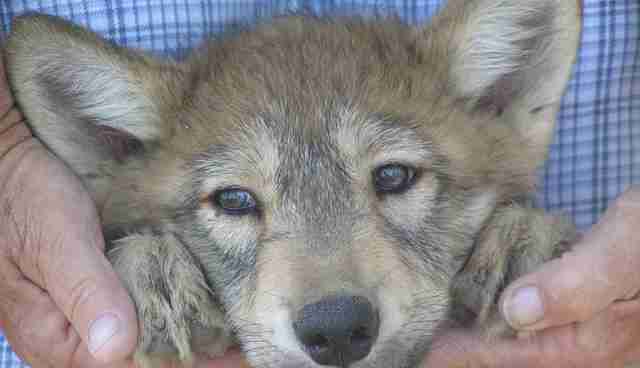 To learn about how to protect our endangered wolves, go to earthjustice.org.